Spent electric vehicle batteries could soon be used to recharge power tools and drive mobile workshops, according to Nissan. The ambitious plans were unveiled at the Brussels Motor Show in Belgium, with Nissan showcasing a concept NV300 carpenter's van with an integrated battery pack called Energy ROAM. With a storage capacity of 700Wh and maximum power output of 1kW, Nissan Energy ROAM promises convenient, emission-free and silent power for recharging tools, laptops and equipment while on the go. 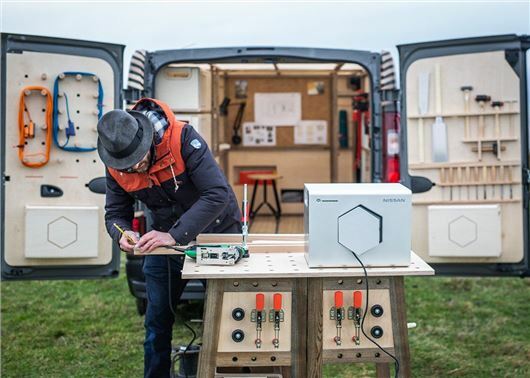 The power pack can be recharged by the van’s diesel engine or via a solar panel – mounted on the roof of the van – making it a complete ‘off-grid’ power solution for builders, electricians and engineers who regularly work in areas where the electricity supply may be limited or unavailable. Nissan hasn't said how much the Energy ROAM power packs will cost or how long they will take to recharge via the solar panel, but has described the concept as "the future of the commercial vehicle". The batteries will be sourced from scrapped Leaf cars and e-NV200 vans. Designed in Britain by Studio Hardie, the concept van features a touchscreen computer, swivel seating on floor rails and LED lighting in the ceiling. The bespoke wooden racking and tools also hint at what future Nissan vans could look like. Francesco Giacalone, Nissan’s commercial vehicle planning and marketing director, said: “With the NV300 Concept-van, Nissan is really thinking about the future of the commercial vehicle.